Other names: Limau pagar, hainan. Malayan kumquat is a native Peninsular Malaysia. It is not known much outside South East Asia. Evergreen shrub or a small tree, 3-5 m tall, branches angular when young, rounded when older, sometimes with single axillary spines. Leaves simple, alternate, lanceolate, 3-10 cm long, pointed or rounded at apex, finely toothed from the apex to middle, dark green, densely glandular-dotted, especially on the underside; petioles often narrowly winged. Flowers borne singly or in clusters of 2-5 in axils of leaves, hermaphrodite, 5-merous, small, white, sweet scented; stamens 16 or 20, cohering irregularly in bundles; stigma cavernous within because or large deep-seated oil glands. 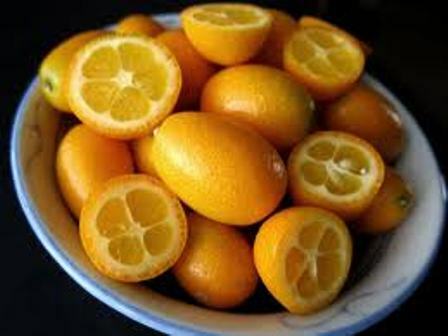 Fruit globose, 2-3 cm wide, 4-6-segmentd, skin smooth, shiny, aromatic, bright orange or golden yellow. The fruits are edible and are eaten alongwith the skin. These are also desiccated and sold as a specialty item in local markets of Malaysia. The fruits are also processed to make a drink or preserves. 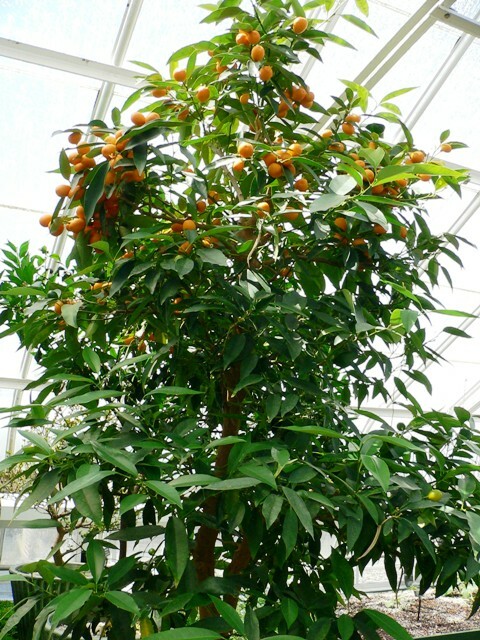 Malayan kumquat grows well in tropical and subtropical areas. However, it is cold sensitive and cannot be planted in frost prone areas. In such areas the trees should be planted at protected spots. These plants are quite ornamental due to their small bright yellow fruits. So these are mostly planted as ornamental plants in gardens and as a roadside shrub. 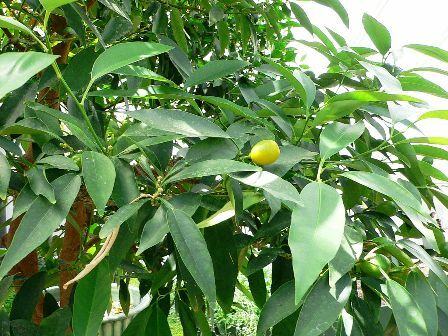 Malayan kumquat is also a popular potted plant too and many nurseries sell it as a potted plant only. It is also sometimes made into a hedge. Malayan kumquat is usually propagated from seed. However, air layering is also feasible and often practiced by nurseries for adding value to their plants.